Portable Grab Bars that WORK. One of the most important requirements when Helen and I travel is that I be able to shower. I can skip getting clean one day, but if i have to go two days without a shower I start feeling really grubby and it ruins the holiday for me. A roll-in shower, or a bathtub that is low enough to facilitate a transfer. Something solid to sit on. A detachable shower head (on a hose). Grab bars, properly placed in order for me to steady myself during the transfer and as I shower. We have learned to pack our own shower seat (more on this in a subsequent post), and I can usually work around a too-high tub or a fixed shower head, but it is absolutely essential for my safety that there be something solid for me to grab onto during the process of getting clean. Unfortunately, although rare, there have been instances where the grab bars were improperly placed, or worse, completely absent. We ran into a case of the latter this past July when we booked a stay in the Court Hotel in Utrecht, The Netherlands. We had a window of three months between when I booked and found out that they didn’t have grab bars, and when we were due to arrive, and I had planned on emailing them with the suggestion that they install grab bars (complete with a handy link showing them where to get them), but I got busy and didn’t get around to it until it was too late. I thought (rightly so) that there must be some portable grab bars available from one of the mobility aids sites on the net, and so I ordered a pair. They seemed quite reasonable at £10.00 for the set, but when I received them I couldn’t have been more disappointed. They were completely useless. They wouldn’t have supported the weight of a kitten. The only thing that kept them from being dangerous is that they wouldn’t fasten to the wall long enough for anyone to actually attempt to use them. I couldn’t accept that there wasn’t a solution to this problem, and then I wondered, “What about those suction thingies that construction workers use to carry/install those big sheets of plate glass?” Those would have to work dependably or else people would get hurt, and I don’t mean just some cripple taking a tumble in a bathtub. Once you get OSHA involved (Occupational Safety and Health Administration; the department of the US government that oversees on the job safety), there has to be a factor of reliable safety. So I did a little looking around on the Internet, and Voile, I found something. What I found was a “Double Glass Sucker”, which is, according to the website, “Ideal for carrying heavy awkward items such as glass, doors, windows and sheet metal”, with a 70 kilogram capacity for £5.11. So I ordered one. It WORKS. I tried it out as soon as I got it, and it was easy to use and clung to applied surfaces with such strong force that I was afraid to use it on our oven door for fear that the power of the suction would break the glass. I have since used it in two hotels (the one in Utrecht, and another one where the grab bars weren’t properly placed), and it held flawlessly. Before I provide you with the link, I must caution you regarding this product for two reasons. A properly installed, permanent grab bar is bolted into the wall itself. This portable grab bar is fastened to nothing more than the tiles, and so will only be as strong as the mortar/grout/adhesive which holds the tile to the wall. It is entirely possible that one could pull the tiles off the wall and take a spill. USE AT YOUR OWN RISK. The surface of the suction cup is 4.5 inches/12 cm wide. If the tiles on the bathroom wall are smaller than that, the uneven surface of tile and grout may prevent an adequate seal. This isn’t so much a caution as an advisory. The suction cups smell strongly of rubber, and so it would be a good idea to pack the grab bar in a separate plastic bag in order to keep the rest of your luggage from smelling like you work in a tire factory. Aside from the above caveats, I highly recommend the purchase of one or a pair of these devices for travel to unknown hotels. They are light, affordable, strong, and very easy to use. I am sure that there are other outlets, but this is the one that I purchased. I have no affiliation with or interest in this company; it’s just the one that I tried and so can offer a first person review of their product. Of all of the European cities to which Helen and I have travelled, Barcelona is one of our favourites. It has much to offer; from delicious food, the Spanish culture and architecture–including some of Antoni Gaudi’s masterpieces—sweeping vistas of the Mediterranean, shops, restaurants and bars, and best of all, for my purposes, Barcelona has the best wheelchair access of anywhere I have ever been outside of the United States. In 1992, Barcelona hosted the Paralympics, and the entire city was revamped for those with mobility impairment and other disabilities, and the result is a city so free of obstacles that you can often forget that you are even in a wheelchair while you are there. The “Barri Gotik”. The old section of town dates to medieval times, with “streets” so narrow that there isn’t room for both sidewalk and street, so it’s all on one level. In other words, it’s flat with no curbs, and the paving is made of big flagstones which make for smooth and easy rolling. The Barri Gotik is a fascinating area full of history and dotted with squares and plazas where one can sit and take in the scenery, or enjoy the ambience with a glass of wine or meal at one of the many restaurants with outdoor seating. 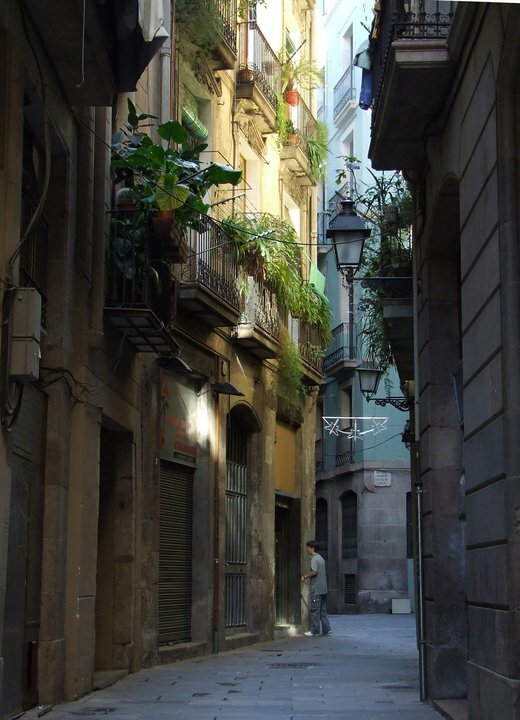 One can easily spend an entire day meandering through the warren of narrow avenues that make up this section of Barcelona. La Rambla. 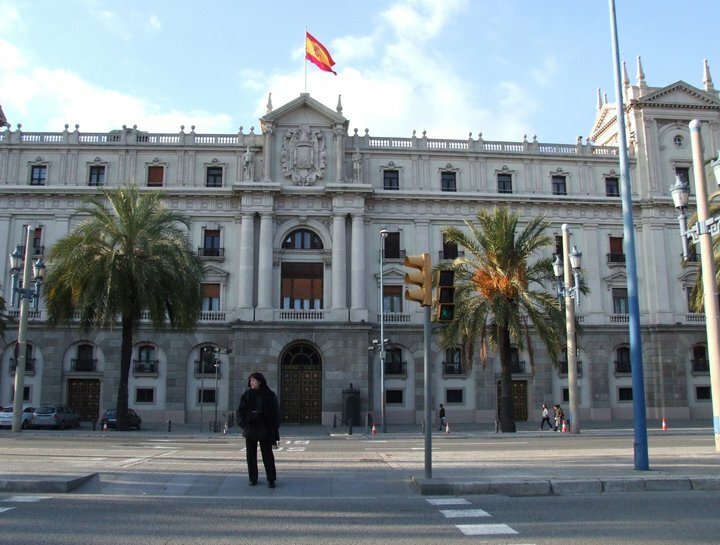 This is a wide avenue that begins just south of the beautiful Placa Catalunya and runs all the way to the harbour at the city’s edge. La Rambla is split down the middle with a smoothly paved, tree-lined passage for pedestrians (no dodging motor traffic), dotted with cafes and market stalls, as well as a wide variety of street-performers. There is a slight incline toward the sea, but it can be easily managed if the wheelchair user has moderate upper body strength. The ramped curbs/kerbs. In four or five visits to Barcelona over the years, Helen and I have covered a lot of ground, and in all but a very few instances out away from the city center, the curbs/kerbs are universally ramped, and done so at such a slight incline as to be almost un-noticeable. I often have to do a “wheelie” (balance on my back wheels) when coming down a ramped kerb in my home town of London in order to keep from pitching forward out of my chair, but in Barcelona there was never any need. The sidewalks/pavements were generally flat without sideward slopes, and the paving stones are smooth and easy to traverse. One truly can forget that one is in a wheelchair in Barcelona. “Menu del Dia”. This is a lunch deal (initiated by Franco in an attempt to eliminate the time-consuming practice whereby the workers of the cities would go home for their lunch), which consists of a set menu with two courses ( starter and main), bread, a beverage ( a beer, soft drink or small carafe of wine) and a dessert, all for around 10-15 Euros. The normal time for lunch in Barcelona is between 1:00 and 4:00pm, and during this time there are many restaurants that serve their version of the Menu del Dia, A restaurant serving a Menu del Dia will advertise this fact with a chalkboard set up out on the sidewalk. The menu is set, but there is some room for choice; fish, meat or vegetarian, for example. It’s a great deal, and a wonderful way to fill up with good food inexpensively. The Mediterranean. It’s a bit of a stroll to get there, but the roads to the beachfront are easy and smooth and with such a slight incline that it makes a journey to the waterfront worth the effort. From the bottom of La Rambla, a left turn will take the wheelchair traveller down the sidewalk, well away from the traffic of Paseig de Colom, and once one gets to the Ronda Literal, it’s easy to cross at the pedestrian crossing (watch the lights as well as the traffic) and head down along the harbor front with the yachts to your right and the outdoor cafes ( they’re expensive, but the seafood in these places can be extraordinary) to your left until one reaches the sea front. There is extensive pathways that allow for a long “stroll along the beach for wheelchair and scooter users. There seems to be something about being able to breathe some sea air and let one’s mind relax with the uncluttered view of the ocean horizon that has a strong rejuvenating effect on a person. Tapas and Paella. Barcelona does these two specialties to perfection. Antoni Gaudi’s structures. The inside of the famous Sagrada Familia church was not open to the public when Helen and I tried to visit in 2006, so I cannot say whether or not there is step-free access to the interior, but the exterior of the temple is unique and elaborately decorated with gothic figures and ornaments and worth the effort of getting there. We did visit his “Casa Pedra”, and although there is a very steep incline down into the building where they direct the wheelchair users, the interior of the structure itself was pleasantly accessible, with a very helpful staff. They even allowed me to take the lift to the roof, where I was hoping to be able to photograph the unusual chimneys and roofline, but unfortunately the accessible space on the roof is a scant 6 feet by six feet and it made me feel claustrohobic. To me it wasn’t worth it, but other wheelchair users might want to take a look and maybe a few photos, so be aware that it is possible and staff members are very helpful and willing to accommodate requests. My favourite part of the tour was the living quarters, where they have left the furniture and decorations of an apartment home in place as they would have been in the 1930’s, when the Casa Piedra was used as a residential block. There are several hotels with fully accessible rooms (roll in showers with shower seat, ample space around the bed, sufficient grab bars in the bathroom, etc) in Barcelona. The “H10” not far from Placa Catalunya on Ronda de la Universitat is Helen and my favourite, but we enjoyed staying at the equally well-located although slightly more expensive “Hotel Jazz” on Carrer de Pelai as well. There are too many restaurants for me to list those with delicious food at affordable prices, but be aware that Barcelona is a haven for lovers of good food, and one is never far from a fine meal in an accessible restaurant in Barcelona, especially near the Barri Gotik. The Placa Real for example is a lovely square, dotted with palm trees full of wild parrots, and a fountain, with four or five indoor/outdoor restaurants around the outer edge of the square. Plan your trip for the spring when it’s lovely and warm enough to be able to dine outside, without suffering the heat of Southern Spain in midsummer. Helen and i have only ever been in January, and while the weather was nice enough most days for us to eat outside, it was a little on the border of being too chilly, and we look forward to going some April or May, a time when the locals advised us that Barcelona weather would be at its best. From the airport, take the Metro Bus if you are going toward Placa Catalunya. The bus will take you directly to the square (Or Placa Universitat, along the way) for a mere 3 Euros as opposed to the 30 Euros it will take you to get there by cab. All of the buses from the airport are accessible, with ramps and space for wheelchair users. Bring a phrase book, and learn some of the basics (“I’m sorry” “Please” and “Thank you” can really help you get along). You don’t need to be fluent, but according to my experiences in Barcelona, you will get treated with more warmth by the Barcelonans if you make a little effort to say at least a few words in their language. Actually, it’s a little more complicated than that, with “Catalan” being the semi official language of Catalunya, of which Barcelona is a part, but almost everyone speaks fluent Spanish, while a surprisingly large portion of the population do not speak any English. Any hotel near the Placa Catalunya will put you in close proximity to almost all of the sights and attractions of Barcelona. Take advantage of the Menu del Dia, and set your activities in accordance with the Spanish Siesta timeframe which results in some businesses being closed from noon until 1pm. Be aware that Barcelonanans tend to eat late, and many restaurants will be devoid of fellow diners until after 8pm. Carrer del Bisbe is the steepest street that I encountered in Barcelona, and I definitely needed assistance from Helen to get up the incline. It’s a beautiful street, but be aware that it’s not an easy trek. 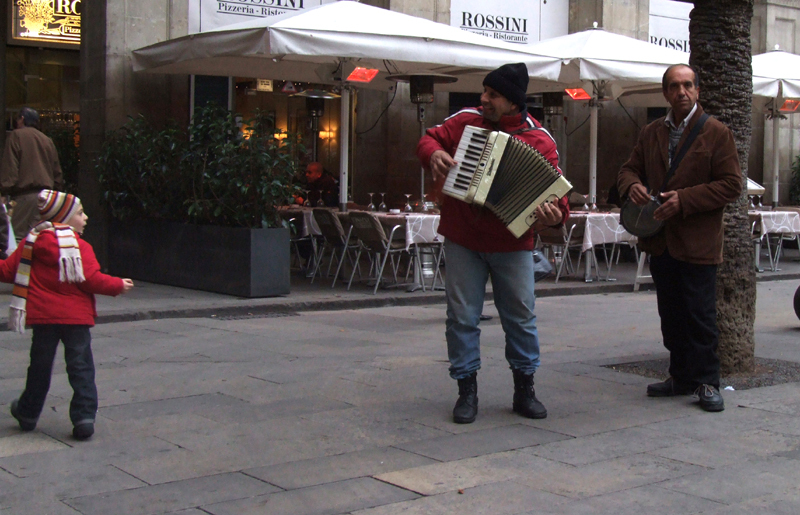 Neither Helen nor I have ever had any problems with crime in Barcelona, but there are reported to be pickpockets in some areas, especially the crowds that form around the street performers. A good rule of thumb is to pay attention to your surroundings and pay attention to anyone who approaches you or your companions, but this is true of any city, really. There is a rather seedy neighborhood known as El Ravel to the West of La Rambla where drug dealers, prostitutes and their clients mingle that one would be well advised to avoid, unless one were looking for drugs or prostitutes. The residents of this section of Barcelona are openly hostile to the idea of being photographed. If there is an International football competition (World Cup or Euro Cup) and Spain is playing a match, or of the Barcelona team is playing an important match, it would be a good idea to avoid the crowds after the game, especially if there is a Spanish/Barcelona victory. We’ve never been there during such an event, but there is ample video on the net that indicates that the celebrations can get a little excessive, and it would be dangerous to get caught up in such a crowd in a wheelchair. In closing, I would give Barcelona high marks for having numerous things to do and see within walking distance of each other, great food and drink, and even higher marks for having the easiest wheelchair access of any European city to which we have yet been. If you’ve ever considered going to Barcelona in a wheelchair, I would go. I think you’ll have a blast.